Tired of pounding the pavement? 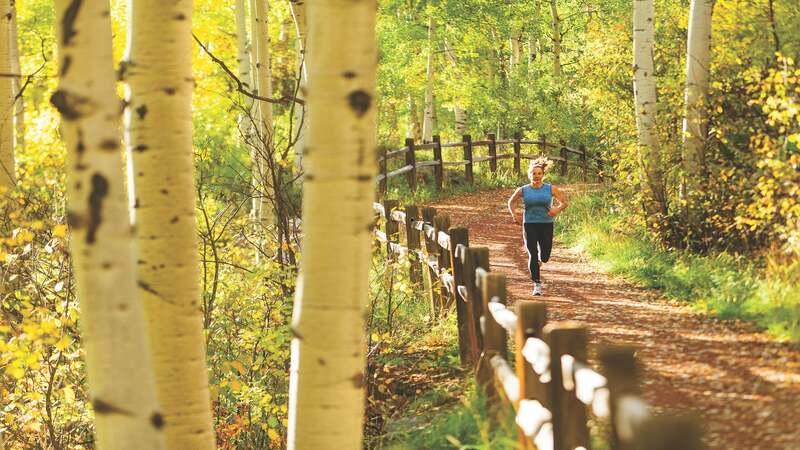 Take advantage of nearby trails for a different kind of run. 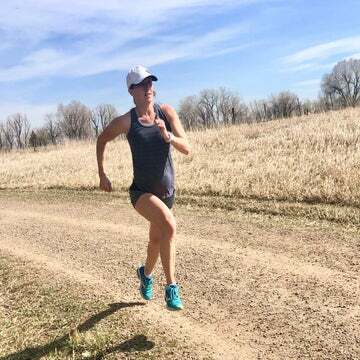 “Trail running requires so much more total-body movement [than running on the road],” says Jessi Stensland, former professional triathlete, movement specialist and founder of Feet Freex, a community that educates people about the natural form and function of the feet. When you’re on the trail, you have to recruit your entire body to navigate obstacles and sudden twists and turns. What’s more, you have to be very mindful of how and where you’re moving your body—or you risk a nasty spill or twisted ankle. Not to mention, spending all that time out in nature can seriously boost your mood. According to research published in the Proceedings of the National Academy of Sciences, spending quality time with Mother Nature can make us less prone to rumination, plus it reduces activity in a part of the brain that’s linked to depression. Navigating uneven surfaces can also boost your calorie burn by 28 percent, according to a study in the Journal of Experimental Biology. That said, trail running takes a certain level of prep to be able to do it safely and effectively. Follow these expert tips to make a smooth transition from road to trail. Unlike running on the road, trails call for you to navigate obstacles, sudden twists and turns and changes in terrain. So, even if you’re already an experienced runner, you’ll want to incorporate these trail-specific activities into your training routine for about one month before jumping into the sport. Jog for 10 minutes to warm up. Then, perform six 30-second sprints on a steep hill (10 percent grade or more if possible), jogging back to the starting point to recover in between each sprint. After the final sprint, run five minutes on a flat surface at 10K pace. Begin with one round of this and work your way up to two to three rounds. Cool down. If there are no steep hills in your area, do this on a treadmill. Jog for 10 minutes to warm up. Then, perform three eight-minute hill runs at an 8 percent grade if possible. Jog back to the starting point to recover in between each rep, or jog three to four minutes if you’re on a treadmill. Cool down. Find an open space to perform the drill. To begin, imagine you’ve got hot coals under your feet and focus on picking your feet off the ground very quickly. Continue forward, keeping your feet in low contact with the ground. Once you’ve gone 100 meters or so, stop and walk 100 meters to recover. Repeat three more times. Instead of running down the road, run along the curb. Or take 45-degree leaps from one foot to the other. Run backward for several paces (making sure to glance behind you). Perform the carioca drill (described below) at random intervals. Hop up on the tree stumps or benches you pass. 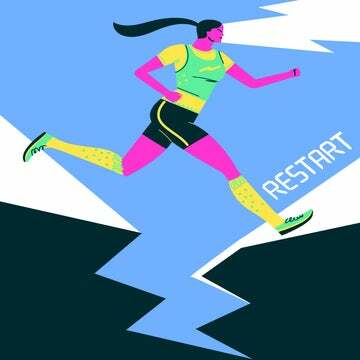 Basically, look for ways to change up your usual runs and make them unpredictable. Just make sure to use caution, especially in high-traffic areas. Begin jogging in a side-shuffle. Then, push off your trailing foot and cross it behind the lead foot. Continue moving laterally, bringing your trailing foot back to the starting position before crossing it in front of your lead foot. Continue alternating stepping the trailing foot behind and in front of your lead foot so you move laterally. Turn 90 degrees to switch feet. Build speed and mobility by allowing your torso to twist as you travel. When shopping for trail-running gear, start with the feet. And no, your regular running shoes won’t do. “There’s quite a difference between a trail shoe and a regular shoe, both in terms of the support but also the traction in the bottom of the shoe,” Paterson says. Stensland recommends going for footwear with a thinner, more flexible sole so your feet can achieve greater range of motion and can better react to the terrain. Your exact footwear will depend on the types of trails you’ll be running on, and terrain will vary depending on the region—some trails are steep and rocky while others are gently rolling and muddy, so do a little homework to find out what kind of trail is most common in your area. If you’ve linked up with a trail-running group or community, ask members for shoe recommendations, or visit your local running store for advice. From there, invest in some quality socks made from synthetic materials (e.g., polyester, acrylic). According to Paterson, your socks should fit snug so the excess fabric doesn’t chafe your skin. In fact, she recommends wearing tight-fitting clothing from head to toe. This way, you’re not weighed down by loose clothing, which can also get caught on branches if you’re not careful. To limit chafing, choose fabrics that wick sweat. If you live in a sunny area, top off your outfit with a pair of rose-tinted sunglasses and a hat. Otherwise, be sure to pull your hair back so it’s all off your face. After all, you need to be able to see where you’re going. If you’re running on a hot day or you’re planning a longer outing (90 minutes or more), make sure you have a hydration pack on hand. CamelBak, Osprey and High Sierra are a few brands that offer multiple options. running groups in your area, or ask your running friends for referrals. Sure, you’re out in nature partly to get away from technology, but it’s essential that you bring your phone along in case of an emergency. Also, GPS can come in handy if you lose your way. Newer trail runners should begin on easier trails to get used to the change in terrain. Then, gradually switch to harder, more technical trails.